Our production partner the company Steier Holzbau GmbH, manufactures HTS near Trier (54329 Konz, Germany). 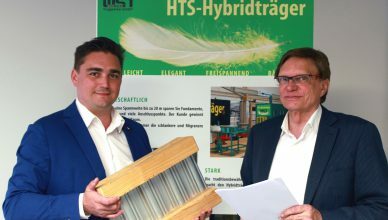 The video shows the production of HTS with two steel webs and a total thickness of 460 mm. The upper and lower flanges have dimensions of 80x 160 mm, two HTS webs ST 300 GL are being fitted. The HTS beams are intended for ceiling structures with a span of 10.50 m and also to expand businesses premises where increased use means there is a requirement for a storage room in an industrial hall.